Hampers, gift boxes, macarons, chocolates, sweets…We have used our expertise in creating exceptional gifts to offer you a wide range of products in Ladurée's iconic pastel hues. They're the perfect way to show your appreciation for your clients and partners on any occasion. With Ladurée, you can offer your chocolate-loving clients and partners a vast spectrum of exciting treats. We also have an extensive delicatessen range, including teas, honey, jams, meringues, and other delicious products. You can also give your clients and partners Ladurée gift cards in four different amounts: €30, €80, and €100. Terms and conditions apply. Share the Ladurée experience! Allow your clients and partners to taste our traditional Parisian treats by sending them a range of delicious products: macarons, gift boxes, chocolates, and more… We will take care of everything. We ship to France and the rest of Europe, and our orders are both customisable and trackable. 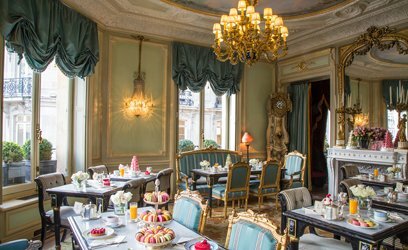 Ladurée delivers throughout all of France, and offers a courrier service in Ile-de-France. We operate fixed rates for France depending on your order cost. Ladurée also delivers internationally. Shipping costs are worked out by weight, destination, and desired delivery date. For orders that meet your expectations, Ladurée offers various personalisation services: macaron printing, ribbons to decorate your macaron box, customisable cards to go along with your gift. Our team would be happy to advise you and help you create the present that best fits your needs. You can print your business's name or logo on our macarons, ribbons, or personalised cards. Ladurée can also create macaron centrepieces in the size, shape, and colours that will best meet the needs of your business, clients, and partners.